We welcome the opportunity to present to you the 2012 United Sports camp programs for boys and girls 3 to 18 years of age. 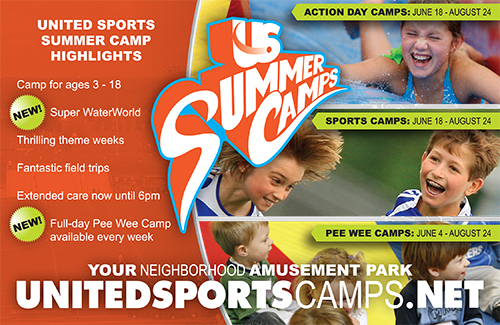 Summer camp at United Sports focuses on the development of physical and social while offering opportunities to expand their creative horizons and add new interests. Children have the ability to try new things, make new friends and become part of a special group that is both supportive and nurturing. All of this is accomplished through the efforts of our experienced professional staff and counselors who make time every day to engage your child in healthy and positive experiences. Our goal is to provide campers with a safe and happy summer filled with engaging activities that increase self-worth and a feeling of accomplishment. Activities: Arts and Crafts, Other Arts, Pottery, Archery, Baseball, Basketball, Football, General Sports, Golf, Inline Skating, Lacrosse, Martial Arts, Rappelling, Rock Climbing, Soccer, Volleyball, Zipline.